What Is DD Form 2? DD Form 2, United States Uniformed Services Identification Card is a form released by the Department of Defense (DoD) and used to identify a person as a reserved, retired, or reserve-retired member of the U.S. Armed Forces. The card serves as proof of eligibility for certain benefits, including medical care and legal assistance. As of today, no fillable DD Form 2 printables are available for download online. The form should not be confused with DA Form 2 - an Australian Government-issued legal form - or DA Form 2-1, Personnel Qualification Record. DD 2 (retired) is blue. It is provided to retired members entitled to the retired pay, as well as to the members that are included in the Temporary or Permanent Disability List. DD 2 (reserve) is green. It is issued to the members of the Inactive National Guard and Individual Ready Reserves. DD 2 (reserve-retired) is red. It is given to the retired members of the Reserve and National Guard who are not 60 years old yet. A preview of the cards is available below for reference. Step-by-step instructions and guidelines on receiving a DD Form 2 ID card can be found in the December 2016 edition of Department of the Army (DA) PAM 710-2-1, Using Unit Supply System (Manual Procedures). Is it Illegal to Photocopy DD Form 2? 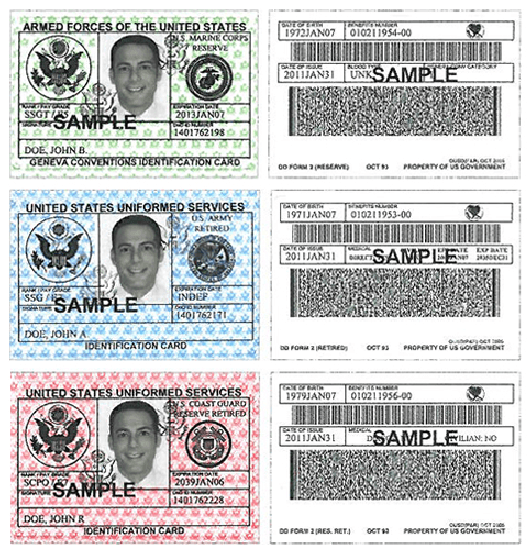 The photocopying of the United States Uniformed Services Identification Card is illegal in most cases and punishable by fine and/or imprisonment. However, in cases of check cashing, facilitating medical care, or administering other military-related benefits, photocopying is considered as authorized and legal. Does DD Form 2 Allow Me to Shop at the Commissary? According to the DoD Instruction 1330.17, DoD Commissary Program all military retirees, active duty, Guard and Reserve members, 100% disabled veterans and the authorized members of their family, and Medal of Honor recipients are eligible to shop at the commissary. The full list of authorized commissary patrons can be found in the abovementioned DA PAM 710-2-1. What Color ID is DD Form 2? The ID card can be blue, green, or red depending on its type. How to Verify the Type of Retiree on DD Form 2? Accompanying family members of authorized civilian personnel overseas. DD Form 1173-1, the DoD Guard and Reserve Dependent ID Card (Red) is a document provided to the family members and dependents of Reserve members and is a proof that the mentioned individuals are pre-enrolled in Defense Enrollment Eligibility Reporting System (DEERS).